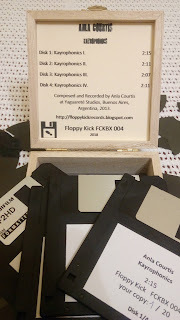 Here is our first release in this year, a 4-diskette wooden box-set by the well-known Anla Courtis from Argentina! We don't have to present him, great experimental sounds in almost 9 minutes. Composed and Recorded by Anla Courtis at Yaguareté Studios, Buenos Aires, Argentina, 2013. The box is covered with 3.5" floppy diskette pieces, each one with unique pattern. You can order it through email or PM to click here for link? or at the Disogs store below.